I was supposed to meet my father at Pho Cali, one of my favorite downtown Sarasota Restaurants, but it was closed- as it often is when I attempt to go. Their hours and days are sort of weird and never seem to coincide with my cravings. Grrrr. We decided to give Drunken Poet a try since it’s a couple of doors away, had a menu that sounded good, and neither of us had been there before. We sat at an outside menu and looked at the menu. They had Japanese and Thai lunch specials to choose from and we both ended up picking Thai. 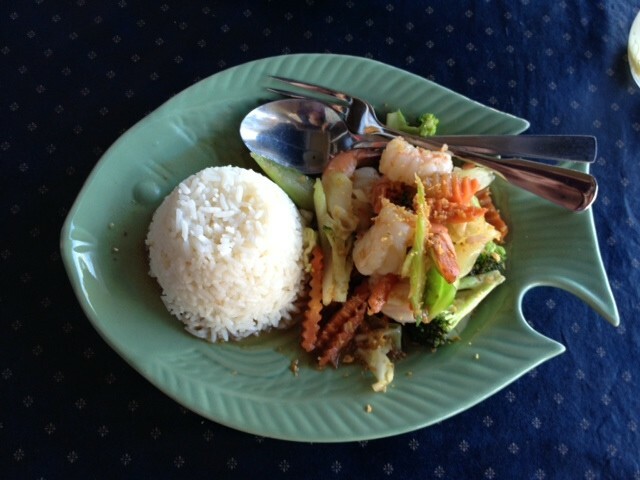 I ordered the Shrimp Pad Pak: Shrimp with assorted vegetables in oyster sauce. We also shared a seaweed salad. 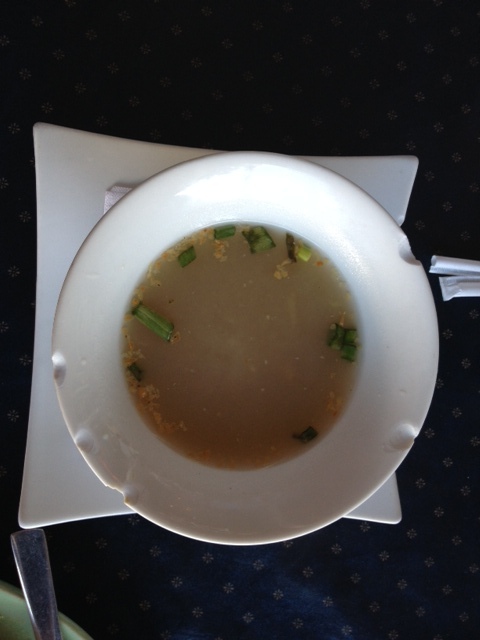 My entree came with a chicken/rice soup that came out first in a chipped bowl. I was going to take a picture of my father’s soup instead, but his bowl was also chipped. The soup itself was not good. It was very salty and the flavor was just off. I left it aside after having 2 spoonfuls. The seaweed salad was standard and we both enjoyed it. Nothing special, but I always love seaweed salad and this time was no different. My entree was enjoyable. There wasn’t a ton of shrimp in it, but the shrimp that was there was cooked well, flavored lightly and fresh. The veggies were also light and fresh. This tasted like a healthy meal to me, without a ton of oil, or unnecessary chemicals or seasonings. Overall, this was a lovely lunch- not the best Thai I’ve had, but not bad. I’m not sure if I’d go back, but If you’re in the area and want a reasonable priced Asian lunch I would recommend it. On my way home from work last week, I was at that stage of hunger where I couldn’t seem to decide what I was in the mood for. I called my honey and had him do a quick search for what was a good in-between spot for us to meet at. With a sushi craving (well, that’s pretty much every day for me) and not a ton of money to burn, we were lucky to find Goichi Sushi Cafe. The website advertised a ‘3 roll combo for $10.95’, and had reviews that were good enough to warrant giving it a shot. I was lucky that he had called ahead because when I arrived, there were people waiting outside because the restaurant is tiny, and all the tables were taken. The little one on the end had a ‘reserved’ sign on it, which I came to find out was actually for us. Yay! The waitress clearly had her hands full waiting on all of the hungry patrons, and we patiently waited along with them. 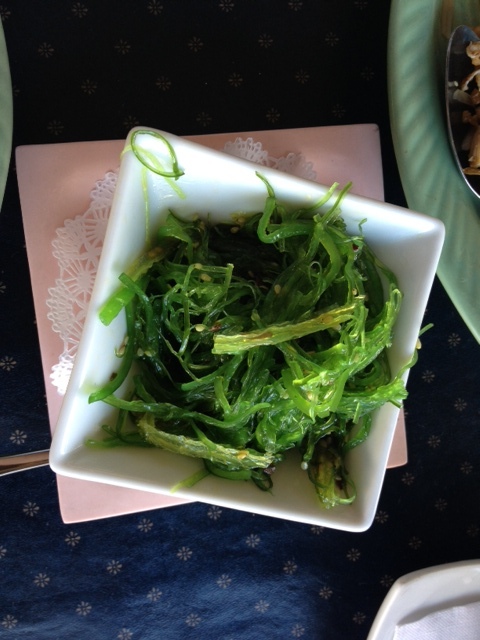 She arrived with menus and water within a few minutes and we ordered a seaweed salad to share to start with. 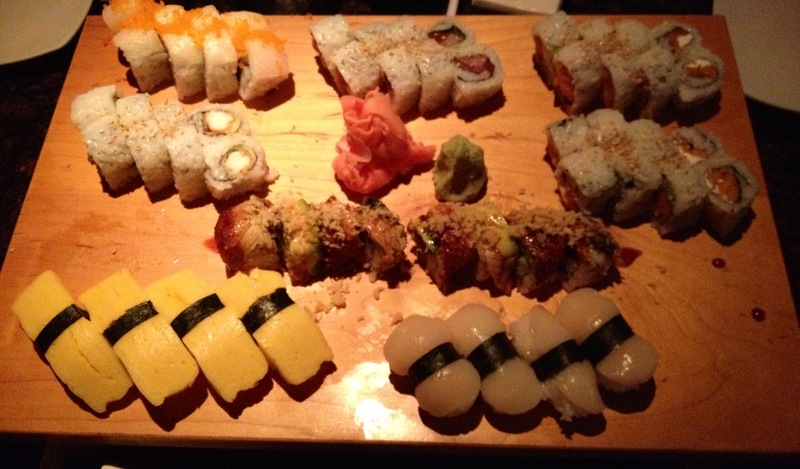 After looking over our options for the 3 roll combos, we each ordered 3 different ones so we could share them all. We also ordered a bottle of sake to share- and were impressed by the very fair price. I would be lying if I said the food came out quickly. We came to find out that there is only one chef, and he had been extremely busy trying to keep up with the orders that kept rolling in. It probably took at least a half hour to get our food. That said, it really was all quite good and fresh, with the seaweed on the outside as we requested. The waitress was very personable and apologetic about the long wait. Overall, I happen to really like the minuscule size of this cafe. It feels intimate and personal, and I got the feeling that most of the people in there were regulars. It’s pretty much on my way home from work, so it’s very convenient for me. With incredibly reasonable prices and an awesome selection, I think it’s safe to say that I will most likely become a regular too. I just may choose to call ahead and pick up my orders in the future to avoid the long waiting time. Gabriel and I were getting a little bored of our standard dinner spots, so we decided to try Tsunami. We were seated quickly and the smiley waitress brought us our menus. I noticed right away that she addressed me very infrequently and pretty much spoke only to Gabriel. Ooookay. I ordered a chicken stir fry which came with a small salad and miso soup. The soup was very salty and I only had a few spoonfuls. The salad was covered in dressing, which I had specifically asked for on the side, so I sent it back for a new one. The sad little salad was made up of mostly iceberg lettuce. Boo. The main dish was also very over-salted, though it was full of fresh ingredients and it was a perfect portion size. Gabriel ordered Pad Thai which was mediocre. Overall, the chef definitely likes his or her salt, and for that reason I doubt I’ll be back. The waitress and the sushi chef thanked Gabriel as we paid and left, and hardly acknowledged my presence. Not a fan. Oh well. AH! Finally, A great place for sushi that isn’t ridiculously overpriced AND has excellent quality fish, creative rolls and great service. The bonus here is that it’s less than 5 minutes from my condo AND they are open for lunch with great deals for around $10. The service was fantastic and we all really appreciated that no one seemed to mind that we lingered to chat long before we ordered and long after we finished eating. Hooray Jpan! Just another reason to love living in Lakewood Ranch. Give it a try! On a quest to find out if there’s anywhere else worthwhile, (aside from Ichiban’s awesome all-you-can-eat sushi for $20) Gabriel and I decided to have dinner at Matsuri a few nights ago. It’s literally one mile from our condo- which is pretty darn convenient, and because of that, paired with the fact that there were lots of good reviews online, we thought we’d check it out. I should mention that we’d stopped in once before when we were heading to a wine tasting across from the restaurant, but we left because it had a very off-putting smell of sulphur. Staying true to my “I’ll try anything twice” motto, we gave it a second chance and were pleased to walk in this time and find no such returning offensive odor. We sat immediately in a comfortable booth and the waitress brought our menus and water. We ordered a salad to share, a steamed gyoza appetizer, some assorted rolls and my standard, tamago sushi. In a sushi class I took a long time ago, I was taught that one of the true marks of a good sushi chef is well-cooked tamago. This basically means that there are no brown striations through it, and that it is fluffy and seasoned just right. In the same way that I choose a plain slice of pizza when I sample a new pizza place, or a pad thai when I try a new Thai place, I always get tamago when I go for sushi. The salad and gyoza were both about average. The salad was not just a pile of boring iceberg lettuce, but actually nice dark mixed greens and other veggies. The dressing was not the classic ginger/carrot one that usually comes at Japanese restaurants, but a more unusual sweet and tangy vinegar based one. The gyoza was super fresh and really delicious, filled with fresh meat and veggies- it was different than what restaurants often serve, presumably right out of the freezer. The rolls were pretty good but nothing to write home about. While the ingredients did seem fresh, the seaweed didn’t have the tell-tale fresh snap to it, and the rice seemed a bit too compressed and overcooked. The tamago, however, was awesome and done perfectly. I could have eaten about 4 more of those. This was a decent amount of food for a decent price- but when it comes down to it, unless it’s blow-me-away good quality, I will have a hard time letting anything win out over Ichiban’s amazing deal. $20 for all you can eat AND the choices are creative, varied and numerous. Yup. That’s still the local winner for me. Gabriel and I celebrated our one year anniversary on Thursday so we decided to go have sushi for dinner, in honor of our first date which was also for sushi. There are only a few sushi places in the area that get great reviews, so we decided to try Pacific Rim since it was often talked about as having the best atmosphere of all of them. It is said that you eat with your eyes first, which I absolutely agree with, but beautiful presentation and a nice atmosphere does not make for a great meal in my book, and the food here was definitely lacking. I should also mention, even though I don’t like to judge people if I can help it, that the clientele here were on the tacky/Miami side. Many of them dressed in midriff-baring tops, way-too-tight pants and sky-high heels. Definitely not the type that Gabriel and I really like to hang with. Sorry. Maybe not very nice, but I’m just being honest. We were seated, as requested, outside on the pretty side porch. It was really cool later when it started storming and little trickles of water came down the walls like a mini waterfall. Inside was very air conditioned and loud, so we were happy to be outside. The chairs were unusually low but the friendly waitress happily brought out a couple of pillows for us and that made a big difference. We looked over the menus and ordered some edamame, shrimp lettuce wraps and a bottle of unfiltered Nigori sake to start. I must comment that this was the FIRST sake I’ve ever liked. It was much sweeter than those I have tasted in the past and I was surprised to find that It was very enjoyable for me. The lettuce wraps and edamame came out soon and we noticed the big clump of salt centered on our edamame. The waitress explained that we were to use the extra bowl to cover them and shake them up, but even after doing that it was hard to get the salt to evenly coat the other pods. The lettuce wraps were plated beautifully, but totally over-sauced and the flavor and texture of the shrimp, pear and mushrooms kind of just mushed up together. For our sushi we chose an assortment including; tempura spicy tuna in shitake caps, scallop and avocado handrolls, tamago, shrimp, eel/ cucumber/avocado rolls, salmon sashimi and salmon roe. The tamago, roe and salmon sashimi were excellent but aside from that, I thought the quality was very mediocre and quite pricey. This restaurant clearly goes for appearances first and taste second and as far as I’m concerned, that’s not enough to impress me. For 1/4 of the total price we could have gone back to Ichiban for all-you-can-eat sushi and next time, that’s most definitely what we will do. My new job is about 3 minutes from Ichiban and when I saw that they offer all-you-can-eat sushi for under $20 (if you pay cash. It’s $23 with credit cards) I couldn’t wait to check it out. Gabriel picked me up from work yesterday and we headed straight over. We were seated right away and given paper check lists on which to make our choices. One menu included teriyaki and tempura options and the other was all sushi, maki rolls and hand rolls. There were 5 specials also included on the list and the waiter also informed us that we could also add salad and or soup. Wow. I was already impressed. The lists were very extensive. We are used to AYCE sushi in NYC that has only the most simple and basic choices and were really excited to see how far our $20 was going to go here. We both started with a salad. The dressing was awesome, but the iceberg (blah, boring) lettuce was not fresh– brown pieces everywhere. We were both happy enough with the dressing that we ate it anyway, and I would quickly come to see that this first course was the ONLY negative thing about the whole meal. Next, the waiter brought out our tempura and teriyaki choices. The tempura was pretty good- though not super light and flaky like it should be…but it was hot and fresh and the flavor of the sauce was perfect. The teriyaki beef was surprisingly good- tender meat with tons of sweet and tangy flavor. It’s cool that when you order from that hot cooked food list, you order by the bite sized piece, so it’s perfect for just having little taste samples of whatever sounds good without committing to huge portions. Next we got our first plate of sushi. (I actually completely and totally forgot to photograph round 2 of our teriyaki, tempura and sushi choices..OOPS!) We had about 10 total rolls and 5 pieces each of very tasty fish. 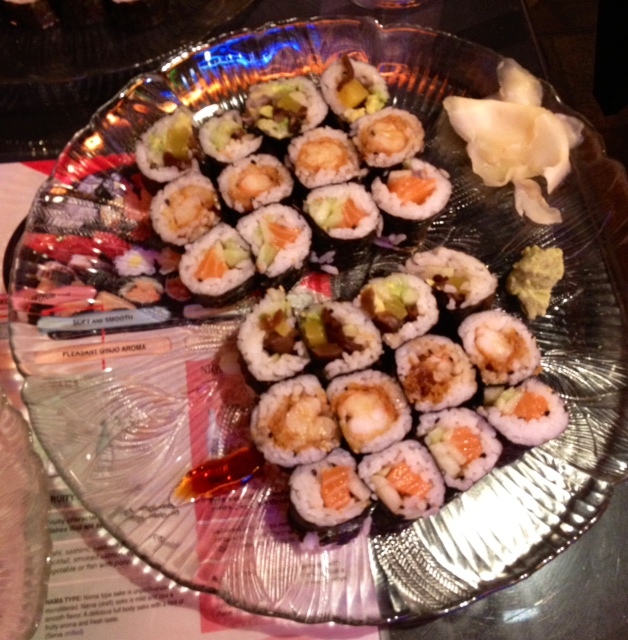 Some of the standouts were the scallop roll, the Sarasota roll (tempura shrimp topped with lobster and eel sauce, YUM. 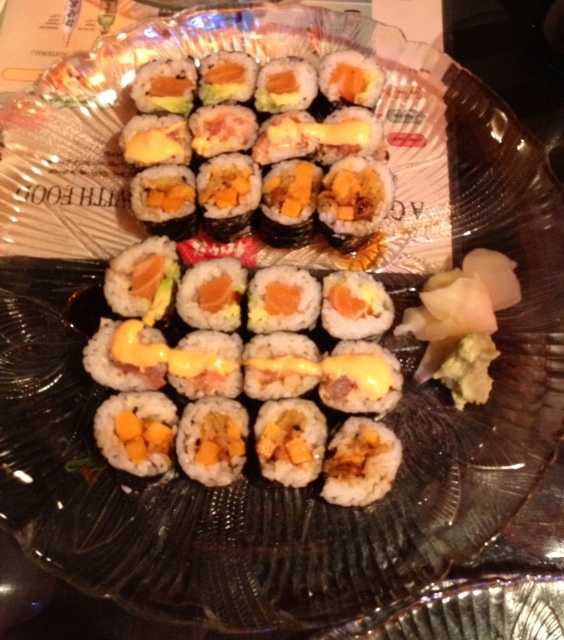 This was my favorite) and the alaska roll. The sushi here is very good. It is not the ultimate, top quality fish you find at some restaurants, but it IS definitely fresh and very very good. If you want to spend triple the amount for fresher fish, than by all means go for it. I’d personally MUCH rather spend $20 for ridiculous quantities of very good quality fish here. When we were full-as-can be, we got our check and realized that we didn’t bring enough cash. My bad. So, we got one of the $19.95 deals but had to pay $22.95 for the one we used a credit card. Including tax & tip, we spent around $50 for this awesome meal, and calculated that we’d most likely eaten WELL over $100 worth. We will definitely, positively, absolutely and certainly be going back. Frequently. Soon. Yay! BRAVO.